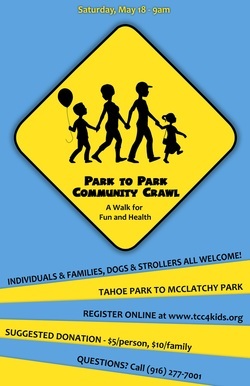 Synopsis: On May 18, 2013 approximately 30 community members, pediatricians and four legged friends made the 2.4 mile walk from Tahoe Park to McClatchy Park. The goal of the walk was to connect residents of both the Tahoe Park and Oak Park neighborhoods to the great resources available at the Oak Park Farmer's market. The weather was beautiful and a great day for a neighborhood stroll!